Poor driving ergonomics can create a lot of muscle pain, especially if you spend a lot of time in the car. Unfortunately, one size does not fit all, or even most, so you will probably need to modify your seat to increase your comfort. Here are some tips on how to do it. Move seat forward to be able to push the gas, clutch, and brake pedals. Adjust back rest for support along back up to shoulder height. Adjust lumbar support to provide even pressure along back. Adjust steering wheel down and toward you for easier reach. Adjust head rest to prevent injury in car accident. 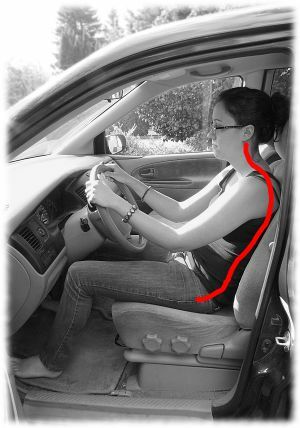 Adjust rearview and side mirrors to minimize strain on neck. Print the brochure and bring with you to your car to make these adjustments. If the seat won't raise high enough, or does not tilt forward to take the pressure of the back of your legs, try a wedge cushion. If your seat has broken down on one side, so you are tilting off to the side, try the wedge cushion sideways. If your seat will not slide forward enough, or there is not enough lumbar support, try a lumbar support cushion. It is really important not to allow your hip joints to be bent more than 90 degrees. 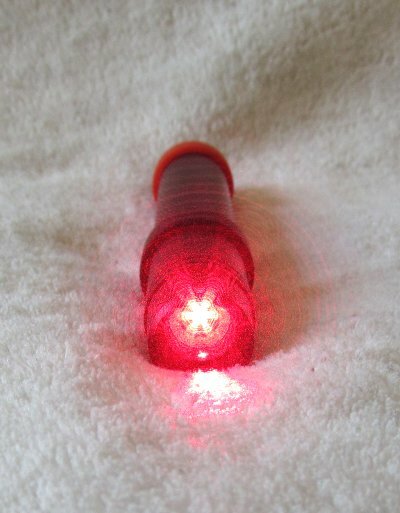 This shortens the psoas muscle and sets you up for low back pain. A wedge cushion can help. So once you have your driving chair set up, you still need to make sure you are sitting in it correctly. 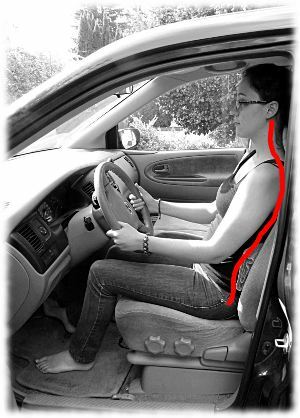 As I have mentioned before in proper sitting posture, you should avoid sitting in one position for long periods of time, and should try to make small changes in your position as well as get out of the car to stand periodically, preferably every hour (but who does that?) At least try about every 2 hours to get out for a minute, even if you just pull to the side of the road and stretch for one minute. You need to sit on your "sit bones" (you will feel like you are sticking out your behind). Allow your spine to lengthen. Your head should "float" up and rotate forward (decreasing forward head posture). 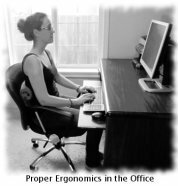 You should vary your position between sitting all the way back in your chair and leaning forward for a few minutes. Don't sit on your wallet - it throws your pelvis out of balance and can create back pain and require a trip to the chiropractor! If you start to get sore, try semi supine technique at one of your breaks. Do some gentle stretches through your ranges of motion and walk around for a minute before trying to lift or unload anything at the end of your trip. The longer the ride, the more important this is. This is the most likely time for you to injure yourself! If you are in the market for a new car, I would highly recommend that you bring this buying guide (also from Loughborough University) with you to make sure that your new car will be able to fit you and not cause you pain! Return from Driving Ergonomics to Proper Sitting Posture. 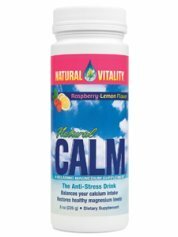 Return from Driving Ergonomics to Muscle Pain Solutions Home Page.